The TPLF regime has practically dissolved the FEDERAL constitution of Ethiopia by hijacking the presidents of Amhara and Oromia regional states. Their excellency — Ato Gedu Andaragachew and Ato Lema Megerssa — are intercepted/banned from doing any leadership activity in their full capacity as head of their corresponding regional states; they can’t meet with each other and their fellow constituencies. Nor communicate their version of events through the state media. Only TPLF’s Debretsion is at large on the state media. Sources disclose that the presidents are being pressured and harassed in a separate confinement while the TPLF regime is carrying out a separate(dramatic) , mafia style, cut meetings with illegal representatives of ANDM and OPDO so as to enforce its will of perpetual tyranny and/or disintegration of the country through further division, conflict and turmoil. “We have done enough research about creating conflicts in the country. We have implemented only samples and experimental ones so far. If you don’t accept what we say, then we will accuse you of whatever and throw you to jail. Furthermore, we will disintegrate the country through further conflicts. Ethiopia and its future is under our control. 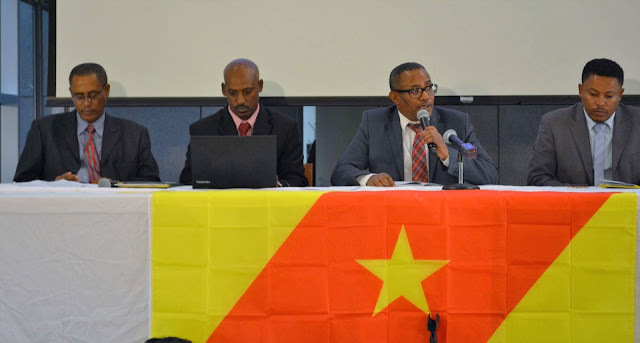 Look at how we played the conflicts in different parts of the country just in the last one year alone,” said TPLF’s rude intelligence officer to the presidents. The presidents —— and all regional MPs — representing the largest seats in the parliament have unanimously asked for an immediate pull out of colonizing TPLF forces, formation of new military leadership, dissolution of TPLF dominated national intelligence and transition to democracy. Furthermore, MPs from these marginalized and predominant constituencies are in their second week of general strike — demanding the puppet PM Hailemariam — for an explanation as to why terorrisme , homicide, conflicts and devastation of communities is actively and proactively carried out by the terrosit TPLF regime. Yet another parliamentary session — called for today so as to deliberate on peculiar legislations that were set by TPLF to divert and divide regional states — was unprecedentedly rejected and boycotted by not just OPDO and ANDEM MPs alone but also the rest of the regional states except Tigray. Large scale protests, home seat-in and closure of business across the country have already started unfolding today. Less and less people are showing up at work. Students strike could follow anytime soon. “There is no greater shame for TPLF than being played out for being bad by all MPs, “ commented Takle Lorabo, a southern observer of Amhara Network and researcher at Dilla university. "It’s quite a dramatic development that the TPLF regime is isolated as it gets from one sucidal trouble in to another. TPLF isn’t a notorious terrorist regime only because it carries out terorisme on its hostages but also because it’s sucidal ,” commented another observer from Semera, Afar on Amhara Network. “ It’s highly anticipated that there will be a nation-wide rebellion in the country crippling the long stretched, weak and divided army of the country of which leadership is overwhelmingly dominated by notorious ethnic Tigrians,” says our analyst for political affairs. After an imperative internal communication carried out last week, the Sudanese and Eritrean national armed forces are reportidley on a stand by while Egyptian Air forces are in an intense fighter Jet rehearsal an unusual. Non-Tigrian armies of Ethiopia are already siding with the people. They are ready to point their guns up all the way to the fall of regime. Militia across the country are on a high alert so as to shed their blood in the fight against any further terorrisme by the regime. The unpredictability of the situation of Ethiopia isn’t just about as to how events will unfold in the country but also geo-politically. It remains to be seen how terrorist regime TPLF resorts to a peaceful transition to democracy ,or disgracfully face defeat by the very people which it oppressed and exploited in the last three decades. Mikael Arage is a techprenuer, manager, engineer, strategist, citizen journalist, life long interdisciplinary student and human rights activist based in Helsinki, Finland. He regularly covers on atrocities, technology and business development in Ethiopia.